In every organization, your Marketing function needs to generate value and revenue, preferably at a good return on resources invested. Doing this well takes having the right metrics. Marketers should leverage meaningful measures, metrics and key performance indicators (KPIs) (both upstream and downstream) to enable organizations to fulfill the role of any business: attract, keep and grow the value of customers. 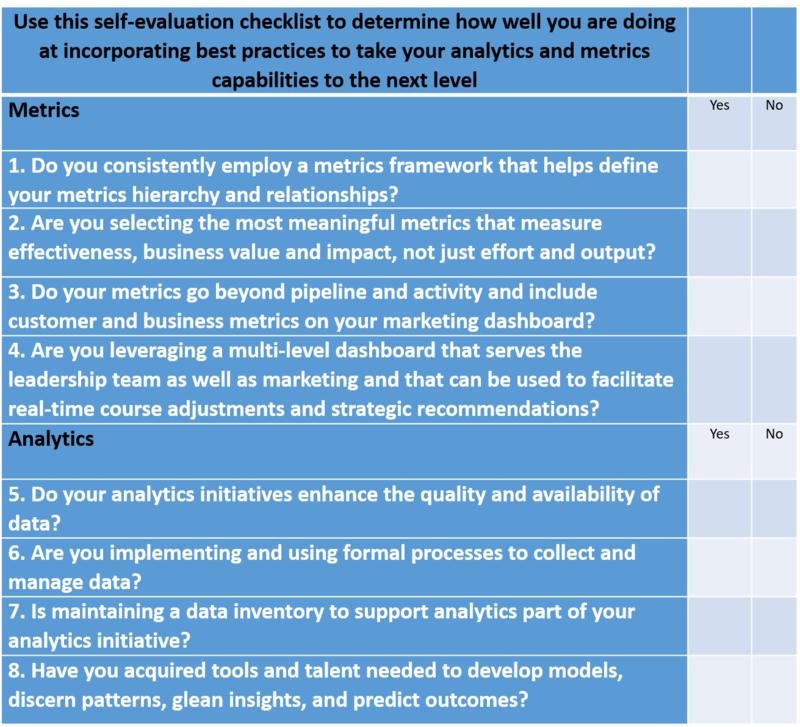 An important and often difficult part of performance management is selecting the right metrics. Applying precious and limited resources to measuring the wrong things is a waste – it is both inefficient and ineffective. The object is to define and select measures, metrics and KPIs that will help you make appropriate customer, program, and investment decisions and understand what is and isn’t working so you can make necessary course adjustments, and measure Marketing’s impact and value. The secret is to select metrics that reflect Marketing’s contribution. There are so many things that can be measured and therefore it is important to have a way to organize and classify your metrics. Our Accelance® Metrics Framework has been adopted by numerous Marketing professionals. Alignment Enables You to Select the Right Metrics and Form a Metrics Chain for Your Marketing Dashboard. 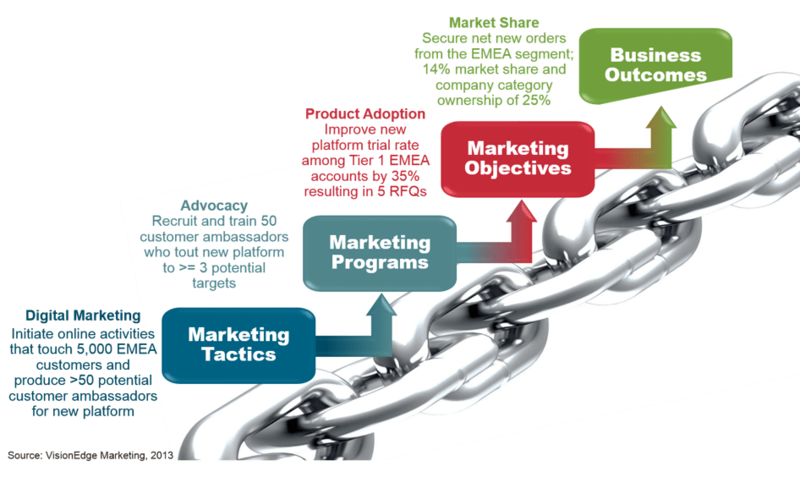 VisionEdge Marketing Published the Concept of Metrics Chains in 2001. Avoid having a smorgasbord of metrics by ensuring your Marketing plan is properly aligned. When you have the alignment, you can craft correct Value-Impact Metrics Chains™, the sequence of metrics that form the links between activity, output, operational, and outcome metrics. Keep in mind that the real test is whether you are measuring what really matters: how Marketing is moving the needle when it comes to customer consideration, preference, engagement, acquisition, loyalty, advocacy, value, category growth, and product adoption. Take your Marketing Performance Management to a new level. 1. Complete Collaborative Consulting Engagements.To expedite results and/or for organizations that want to leverage all of VEM’s expertise, maximize knowledge and skill transfer, and benefit from a change management plan,we provide a robust, customized consulting engagement designed to address your unique needs. Together, we work hand-in-hand to build a best-in-class Marketing function for your organization that is fully aligned to business outcomes and ready to demonstrate and achieve excellence. 2. Identify Your Gaps and Needs with our Proven Audits and Assessments. VEM’s Marketing Performance Management help you audit and benchmark your organization’s metrics, overall measures and dashboard assessment. You will be able to see exactly how you stack up against best-in-class organizations that get high marks from the C-Suite for their ability to prove and improve the value of Marketing. By identifying any gaps you have as well as understanding how to address them, we help you dramatically improve your organization’s alignment to help increase Marketing investment.